The crowd will go wild for this sweet and savory party mix! With the array of Candy Melts candy colors available, you can customize this mix to fit your team colors. Great for football tailgates, cookouts or just watching the game at home, get everything you need to make this fun recipe and enjoy the game! Show your team spirit with Surprise Inside Stuffed Cookies. Colorful Candy Melts candy comes in tons of team colors, perfect for surprise fillings. Serve straight from the oven for ooegy googey, melt-in-your-mouth goodness. Learn to make this delicious Candy Melts football field fudge. This easy-to-make sweet treat is sure to be a hit at any football tailgate or party. It’s just the right bite for any football fan. Get everything you need to make Candy Melts candy fudge here! Crunchy crisped rice cereal covered in tasty peanut butter, light and sweet sugar and delicious Candy Melts candy, everyone loves this classic game time treat! Quick and easy to make, you can whip up a batch of this chow mix in your team’s colors to please your home crowd in no time. PB and crackers just got a whole lot tastier! Learn how to make these football-shaped peanut butter and cracker sandwiches dipped in delicious Candy Melts candy. These little sandwiches make a great snack for youth football teams and fans, or whenever you’re watching the big game! Get everything you need here to make these fun little sandwiches right here. Learn how to make this Team Colors Football Candy Bark. With Wilton’s vast assortment of Candy Melts candy, this fun candy bark can be customized to fit any team colors! Make it for a youth football treat, or impress the guests at your big game party. We’ve got everything you need for the best game time treats! These tasty Football Edible Shot Glasses are sure to be a touchdown at your big game day. Fill these little cups with ice cream or your favorite liquor for a treat anyone is sure to love. Made using Candy Melts candy, these edible glasses can stay out at room temperature without you having to worry about them melting. Learn how to make these fun football helmets with Wilton Candy Melts candy and doughnut holes. It’s an easy-to-make project you can customize to fit your team colors and numbers! Great for any tailgate or any time you gather to watch the big game, your friends and family will go wild for these doughnut holes. Get this great recipe and everything you need here! These referee wafer cookies will be the best call of the game! Make them for any youth football team treat, tailgating party or just to impress your guests while watching the game at home. Sweet wafer cookies with Candy Melts candy are an easy-to-make treat that taste great, too! During the game, everyone will be huddling up to snack on these sweet and salty treats! An almond football goes over the middle of a pretzel ring, with easy-melting Wilton Candy Melts filling the gap in your favorite team colors (we went with blue and orange here). Whether tailgating or enjoying the game at home, these cupcakes will definitely be deemed MVP. Pipe the candy goal posts freehand using melted Wilton White Candy Melts® Candy. Create a delicious candy football cupcake topper by piping it freehand with Wilton Light Cocoa Candy Melts candy. Serve these cupcakes as you cheer on your favorite team! Salty meets sweet in this super playoff of flavors. Decorated like footballs, these delicious Candy Melts candy dipped chips or crisps will be a hit at your next party, so make a bowl full because no one will be able to each just one. 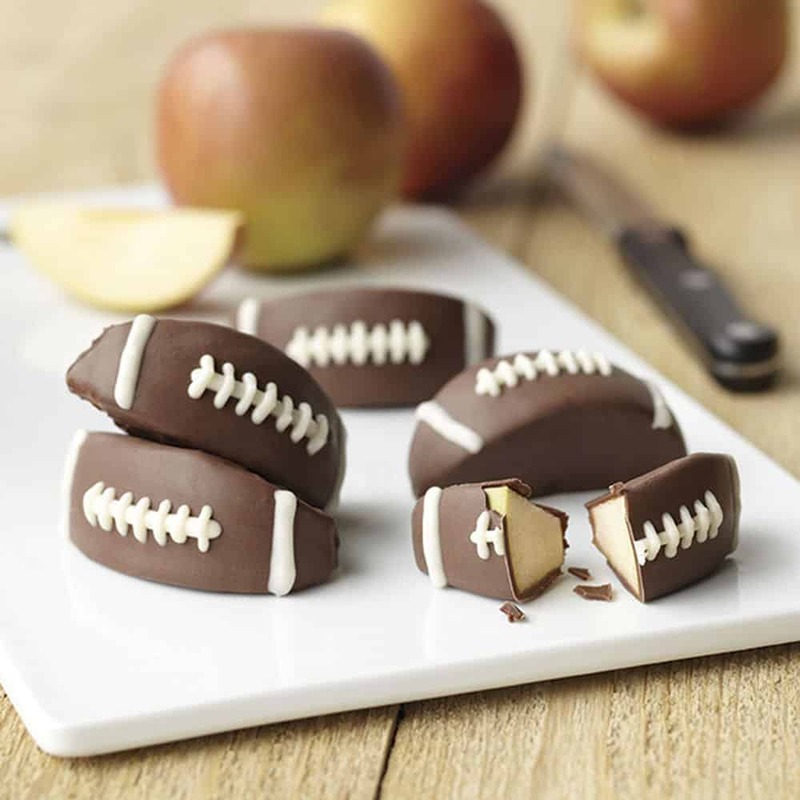 Dipped apple wedges decorated like footballs make a sweet treat for your favorite playoff celebration, tailgate party or after-game snack for the tiniest tackle on the team.